Crochet isn't just for making afghans and scarves, it can also be a handy skill for making photography props that will make your photos stand out. 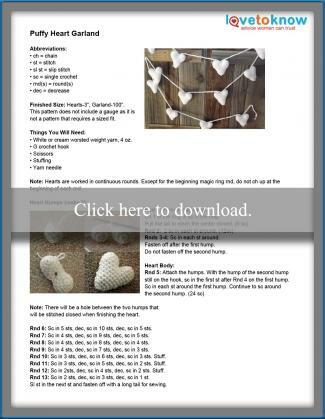 Use these crochet patterns to create a beautiful hammock for a sleeping newborn and a romantic garland of hearts to add to the background for engagement, Valentine's Day, or baby milestone pictures. Both projects are simple and quick to stitch up for all skill levels. 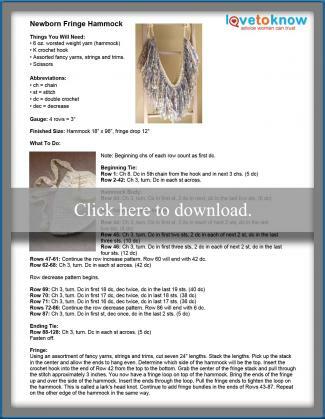 Click on the pattern images to download the Adobe printable pattern for each project. This hammock pattern is worked from the top of one tie to the top of the other using simple crochet stitches that can easily be achieved by a beginner. The fringe is attached using a basic lark's head knot. If you would prefer a longer, wider hammock, thicker yarn and a larger crochet hook can be used. Fancy, specialty yarns can be pricey, and if you live in a small community, they may be difficult to find. When fringing your hammock, try thinking outside the box with items that can be used as substitutions. Jute and twine will add a rustic feeling. Recycling the tape from an old cassette tape will provide a light, airy appearance. Unravel the plies of cheaper yarns for a beautiful, crinkled, texture. Choose colors that match the baby's room, outfit, or other props that will be incorporated in the photo. Once your hammock is complete, you can use it in a number of ways. This hammock is meant to be used as a prop during newborn photo sessions. Do not leave your baby unattended. For the safety of your newborn, composite images are recommended for hammock photos. To hang the hammock, choose a thick branch or pole that is unlikely to snap if an adult hung from it. Cut it long enough to extend between hammock frames or two sturdy chairs. Wrap the ties around the branch and form strong knots to secure. Achieve double-duty with your fringe hammock by incorporating it in other newborn photos. It can be used as a blanket on the floor with additional layering blankets, or place it in a basket or bucket with the fringe hanging over the sides. The puffy hearts in this pattern are quick and easy to crochet and are perfect as a take-along project for the car or while waiting to pick up kids from activities. Use these tips to help with the garland pattern. Set up a mini assembly line when crocheting the puffy hearts. Crochet all the first humps for the 12 hearts on the garland before continuing with the second humps and the bodies of the hearts. For a slightly different style, don't stuff your crocheted hearts. Use red or pink yarn instead of white, or try variegated colors that will really pop against your photography background. Making your own props is an economical way to keep costs down. Make the most of your efforts by utilizing your garland in a variety of photo sessions. The crochet heart garland can be used for engagement, anniversary, wedding, Valentine's Day or baby photo sessions. Use the garland as a swag on your backgrounds. Form the length of the garland into a heart shape on the floor. Place your baby or the hands of newlyweds with their rings displayed in the center of the heart. Loosely wind the garland around a newly engaged couple. Place the heart garland around a floral garland for added fullness and romance. Whether photography is your hobby or your profession, investing in props can be a costly endeavor. Keep expenses down by crocheting some of your own props that can be used over and over again.